Author Danni Martin is also the award-winning author of the Hungry Healthy Happy blog about healthy eating, exercise and weight loss, and also a fellow Mancunian, and this book is the personal result of Danni’s journey. Overweight and in ill health in her 20’s she decided to take control of her life, her health and her weight and change the way she related to food. Danni’s ethos to this book is to provide recipes which allow us to rediscover our love for all our favorite foods, reinvent them as more nutritious and wholesome versions of themselves, as the title states, ‘How to nourish your body without giving up the food you love’. This isn’t just a book about food and recipes though, Danni will tell you her story and discuss with you the principles of losing weight, the importance of exercise, and how to eat well for less. Personally this is not a book that I would generally go out and buy, I have very few ‘healthy eating’ books in my collection, the ones I do have are generally more specific to nutrition and purely for the benefit of learning and education. However, if I was recommending a book as guidance to healthy eating and weight loss than this would be a very good book to use and it would be a good start for anyone who wants to kick start a healthier regime. All sections are covered, breakfasts, snacks and treats, light meals and lunches, hearty main meals, side dishes, desserts and drinks (healthy ones, not cocktails!). There is also a section on store cupboard essentials and a meal planner to help you organize yourself. There is nothing difficult in this book, the recipes are easy to follow and anyone who loves to cook from scratch will have no problem here. The photography is simple and clear and does justice to the recipes, they look as you would expect them to, there are no chintz, no exotic location and no added edible flowers scattered everywhere, what you see is what you get and for me, that’s a good thing. For reference this is not a ‘clean eating’ book, there is no preaching about what you can and can’t eat, this book is simply about providing good advice on how to turn your meals into something just that little bit healthier for you. Each recipe is labeled vegetarian, vegan, gluten free diary free and for those motivated by food measurements there is also information on every recipe providing you with a breakdown of how many kcal there are per serving, along as the amount of fat, carbs, protein, fiber, and sodium. 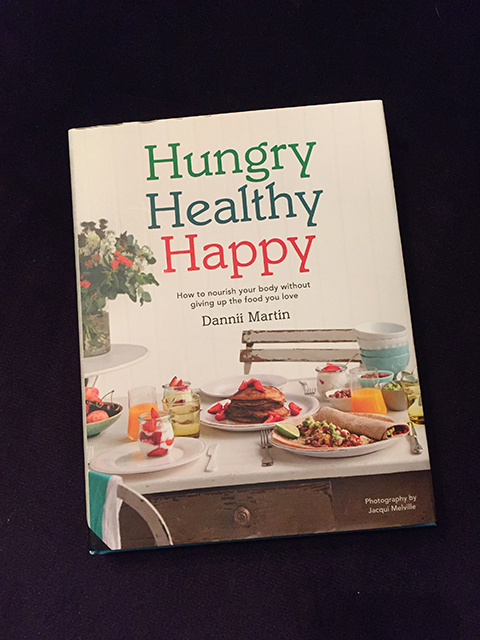 ‘Hungry Healthy Happy by Dannii Martin is published by Jacqui Small (£20). More information on the book can be found here. 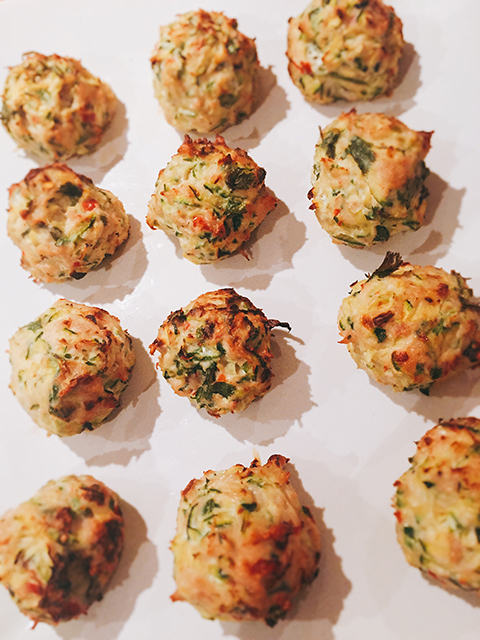 These were snapped up and eaten in minutes and with only 5 ingredients they were simple to make and we will definitely be making these as little bites at parties. 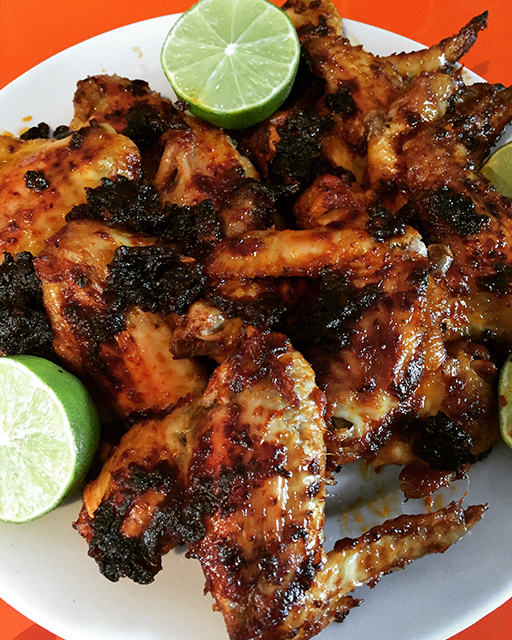 The sauce on these wings was tangy and delicious, squeezing the lime over adds some acidity and a finishing touch. The black sticky bits left in the roasting pan where the best! 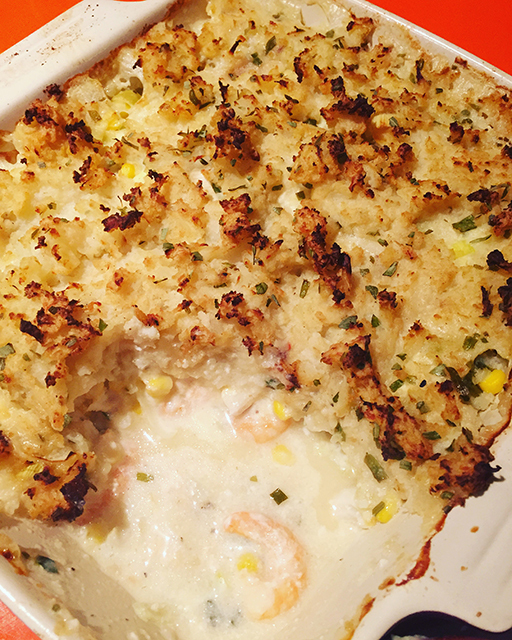 Who doesn’t love a fish pie? This is a lighter version than I would normally make but then that is the ethos of the book. Do not however think it will lack flavour because it doesn’t. The cauliflower mixed in with the potatoes reduces the carb intake and the dill and low-fat cream cheese ensures this pie is still creamy and packed full flavour. 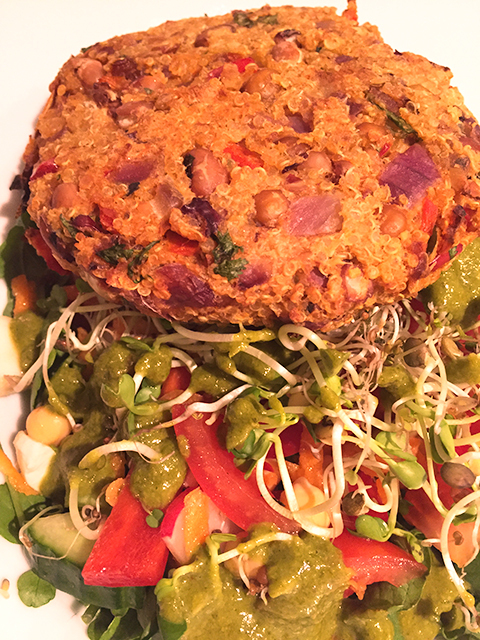 Quinoa is a bit like marmite for some people but we have always loved it. Admittedly it is bland by itself so you always need to add punchy flavours to it. This burger has sundried tomatoes to do just that but make sure you buy quality ones, we used ‘Taste the difference’ marinated sundried tomatoes in oil from Sainsbury’s and they did the trick. Another very simple recipe with classic Mediterranean flavours, tomatoes, peppers, olives, parsley and lemon. 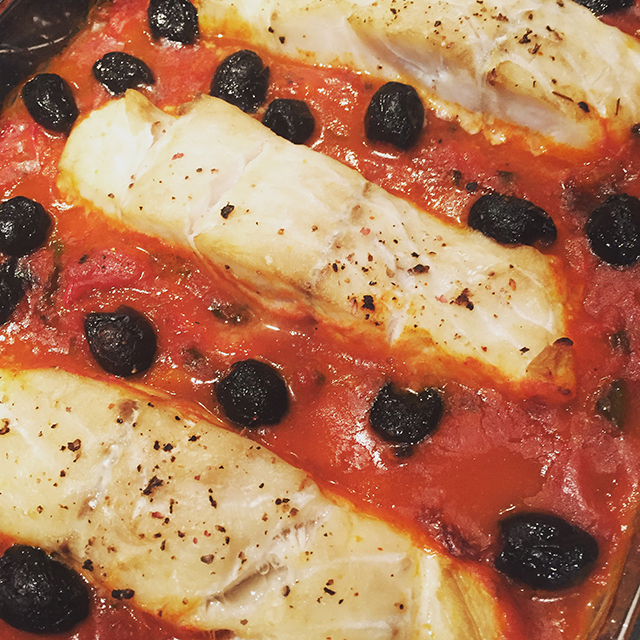 You can use any white fish for this recipe, we used coley fillets. 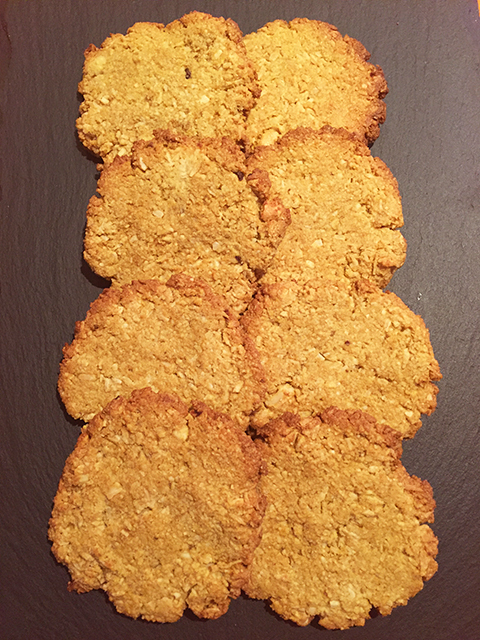 I was a bit unsure how these would work as there is no fat whatsoever in them and the ingredients are binded with lemon juice and maple syrup. They did work and they were fantastic, gingery, nutty and not to sweet and if you eat more than one you don’t really have to feel guilty.